Windy days at our Deception Glacier camp made for challenging working conditions, but nonetheless we got some good work done to wrap up our field season. We also had a great, two-man film crew working on an educational documentary with us during our last week in the field. They provided an interesting diversion and seem to have captured some great footage of our team, the landscapes and the work. Part of our team heading back to camp after one of the last days of work on Mt. Ritchie. 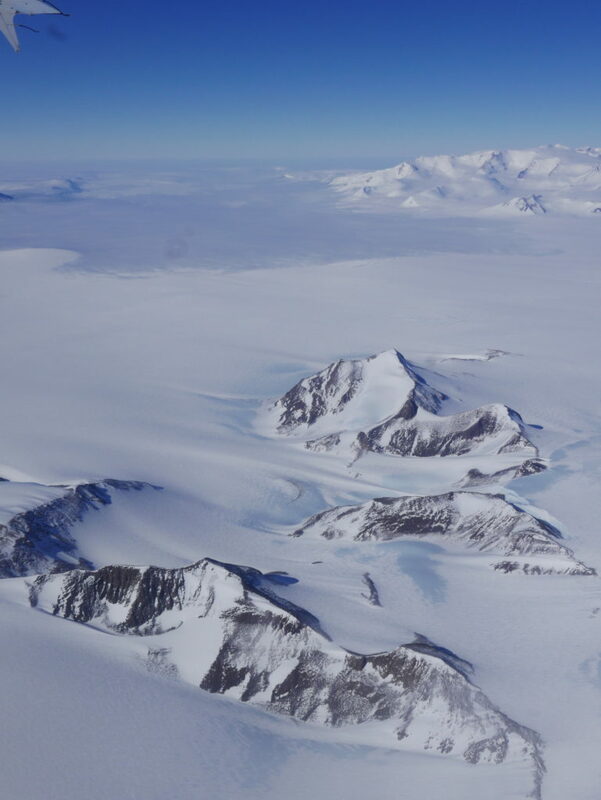 The ramp of ice in the middle-ground of the image is flowing from the ice cap (out of the image to left) into Deception Glacier (to the right). On Thursday, Jan. 17, we had two Twin Otter flights to begin our camp extraction. John Long (of Flinders University in Australia) and I were on the first flight back to the research base with all of our fossils and about 1,000 pounds of cargo. The film crew were in the second flight with their camera equipment and other cargo. It felt great to get cleaned up (first shower in four weeks), do laundry, eat and drink to our heart’s content, and sleep in a bed again. The other four team members planned to depart the next day, but weather conditions degraded and the flight operations center cancelled their extraction on the 18th… and the 19th… and the 20th! They finally got back to McMurdo Station on the 21st. 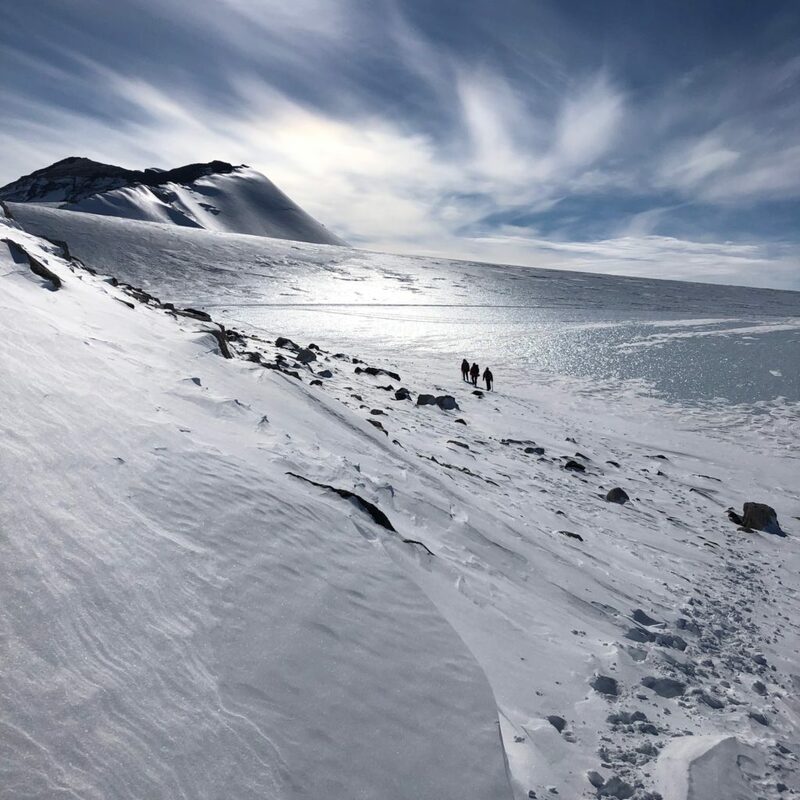 I must admit to feeling a bit guilty when we were back in the relative comfort of the McMurdo Station, and they were stuck out there for three additional days, but that is the nature of things down here. From the moment of our return to McMurdo we’ve been busy. We packed 500 pounds of fossils in four wooden crates for shipping back to the U.S. The fossils crates will ship out of McMurdo on the re-supply ship that arrives in about a week. 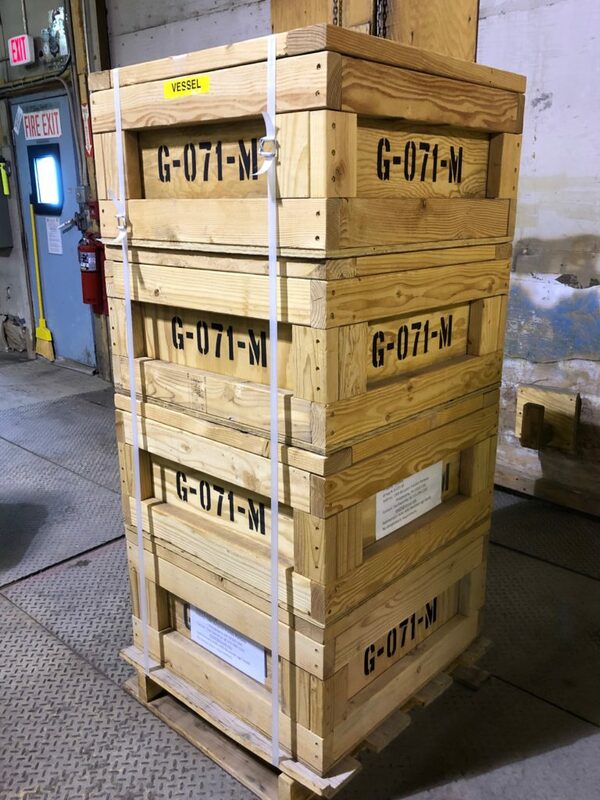 500 pounds of our rock/fossil samples crated-up and ready to load on a supply ship that will arrive at McMurdo Station in the next week. Currently an ice-breaker is making a channel through the sea ice from the Ross Sea into McMurdo Sound. McMurdo Station gets two ships a year. The freight arrives with a year’s worth of equipment, food, vehicles, etc. and then loads northbound cargo of a year’s worth of trash and recycling, as well as scientific specimens of all kinds. The second ship that visits McMurdo Station brings fuel that is pumped into huge storage tanks to keep all aspects of the base working. View from the Twin Otter plane as we left Deception Glacier and crossed the Skelton Névé region. We gave a lecture to the McMurdo Station community on Sunday night. It was a great chance to describe why fossils from the Devonian Period are of such interest. Our audience was fellow scientists and a wide variety of support personnel that provide the vital services to keep the science and all aspects of the base running smoothly. It was wonderful to see everyone engage in our work, and I hope they felt like they were part of the effort. We even brought a box full of recently collected fossils for some show and tell. If all goes as planned, we’ll be getting “off the ice” on Wednesday morning, flying back to Christchurch, New Zealand. I’m looking forward to exploring New Zealand a bit before heading back to Philadelphia in mid-February. I’ve been away from home for a long time, but it’s been full of interesting and exciting adventures. Our fossil-filled crates will land in California and then get shipped across the country to the Academy, arriving at about the same time as an Academy Town Square talk that I’ll be giving about this trip at the Academy on the evening of Thursday, April 30. Hope to see you there! Great work, Ted! Sounds like you could use some down time in the sun. Hope to see you on the beach. What a great trip and exciting research! Your photos are outstanding. My best to the Daeschler girls when you get home!